The superior service starts with our consultation process, where we gain an understanding of your particular needs and tailor the service to best meet your requirements. The consultation process takes account of such things as the following. Total number and age structure of children. The service includes a full monthly menu, which has been carefully constructed to provide the children with a wide range of different foods to meet their nutritional needs. Packaging clearly indicates which meals are to be used each day, including any special diets, which are individually flagged. The food is delivered chilled, not frozen, therefore, you have no need to worry about defrosting, thus reducing reheating times and saving electricity and time. All packaging is suitable for use in a conventional or microwave oven. You must carry out normal temperature monitoring. When you are ready you just heat and serve. Packaging carries instructions on heating and you are provided with guidelines on food safety. 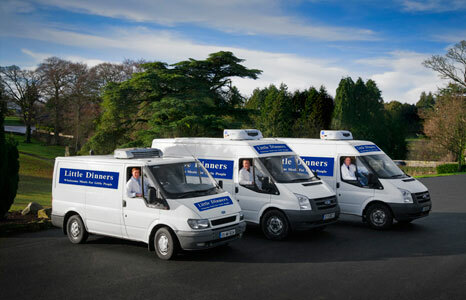 In the interest of food safety we will provide you with a fridge for storing "Little Dinners". This remains our property and is provided subject to certain conditions. We like to monitor how well the service is meeting expectations and welcome feedback and suggestions.